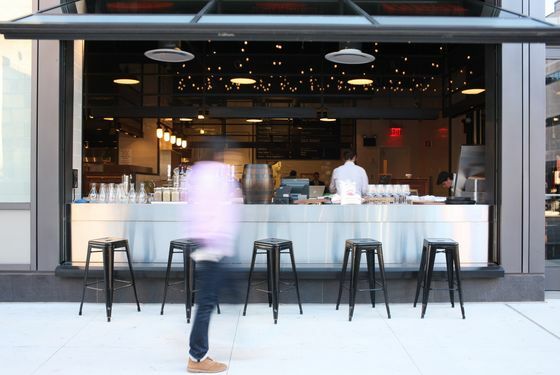 The staggeringly expansive Hell’s Kitchen market has opened in the ground floor of the block-though building at 600 11th Avenue. 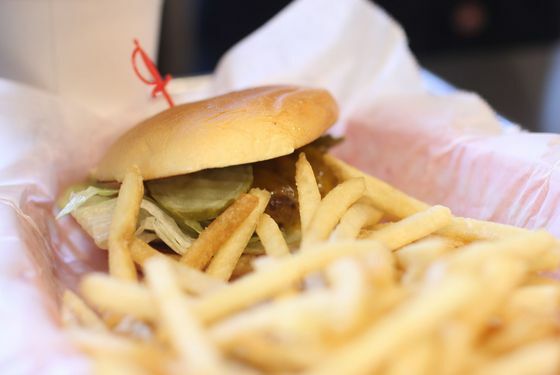 It’s got quite the lineup, too: AvroKO, for starters, is serving fish tacos, pulled-pork sandwiches, burgers, and more at its Americana-imbued Genuine Roadside. 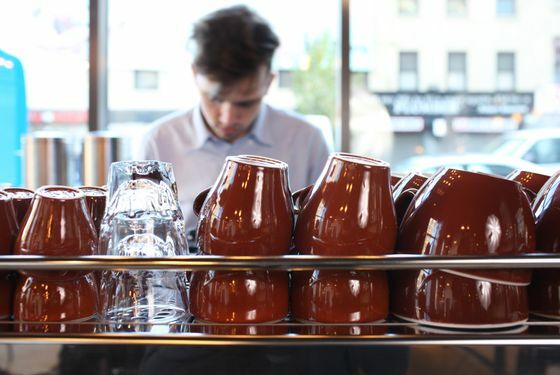 Meanwhile, Caroline Fidanza based her Little Chef menu of soups and salads on sandwiches she serves at Saltie in Williamsburg; the Cannibal and Resto owner Christian Pappanicholas is serving hot dogs with Chinese mustard and tripe chili, and Seamus Mullen has opened a tapas bar called El Colmado. 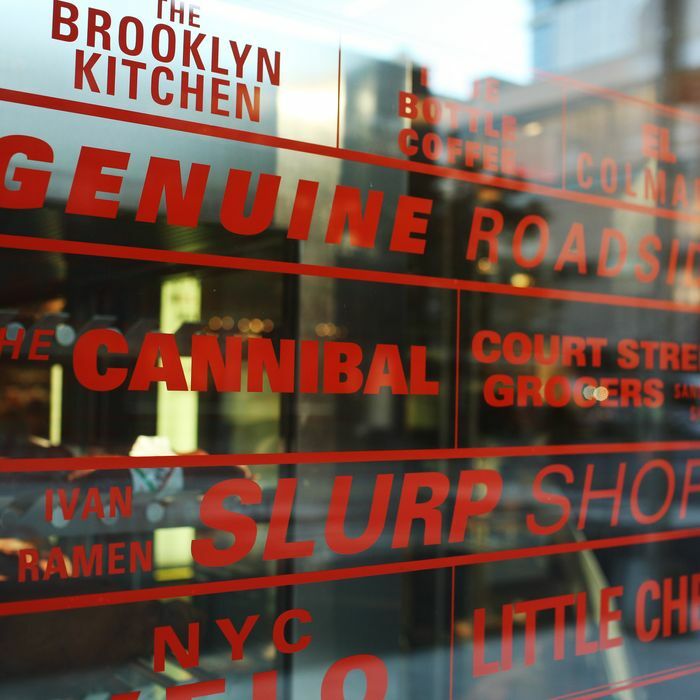 In addition to its retail component, the Brooklyn Kitchen has a demo space where chefs and cookbook authors will teach classes and make public appearances; Court Street Grocers has a dedicated sandwich shop; Blue Bottle is now steeping New Orleans–style iced coffee; and meanwhile, noodle master Ivan Orkin has (finally) opened his first ramen-ya outside of Japan. Oh, and there’s also a bike shop and showroom. Check it all out, straight ahead. 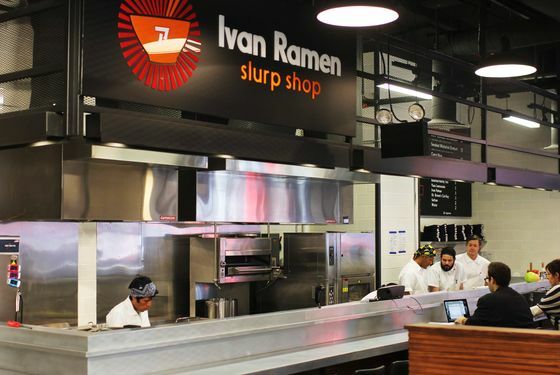 There’s Ivan Orkin’s anticipated Ivan Ramen Slurp Shop, for starters. 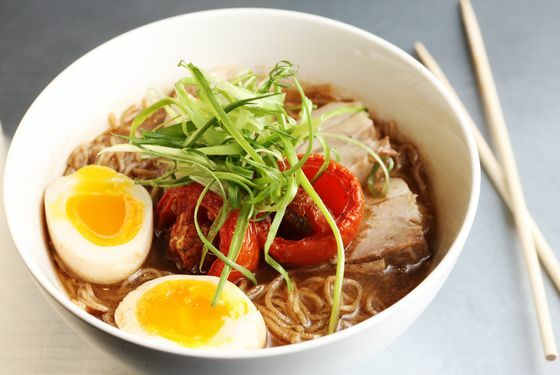 … The cornerstone of which is Orkin’s classic shio with “double soup,” seen here with roasted tomatoes, rye noodles, and pork chashu. Here’s the Italian combo from Court Street Grocer’s Sandwich Shop, which includes mortadella, capicola, soppressata, Swiss, mozzarella, Pecorino Romano, arugula, red onion, CSG Hoagie Spread, and mayo on a roll. And the vendor’s Gotham West HQ. 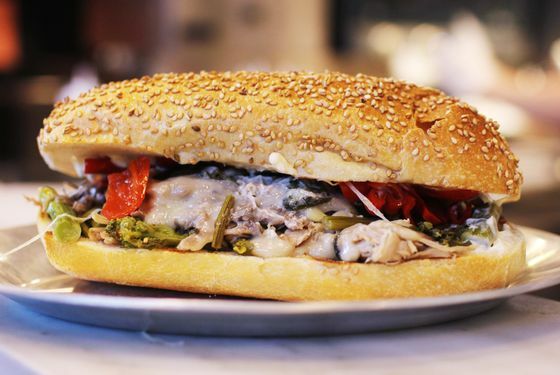 Here’s the stunning Clean Slate from Carolie Fidanza’s Little Chef. 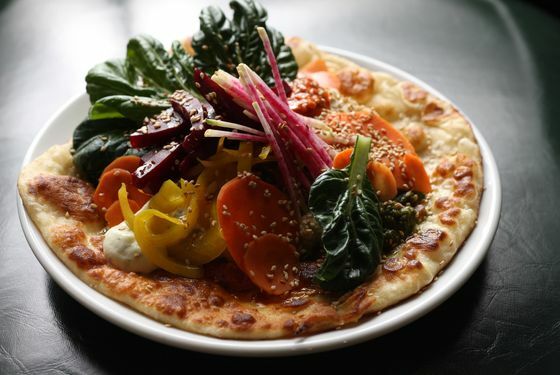 It’s got hummus, quinoa, pickled vegetables, and yogurt sauce on naan bread. Healthy as it is pretty. 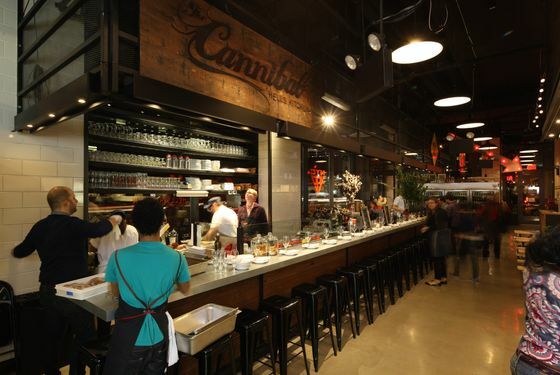 Over here, we have the counter at the Cannibal’s Hell’s Kitchen outpost. … which means, among other things, the kitchen isn’t afraid to put iceberg lettuce on hamburgers. 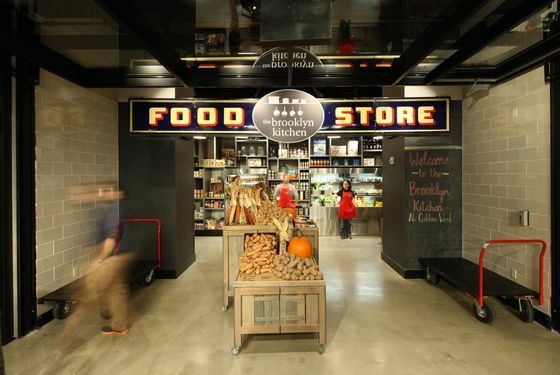 The Brooklyn Kitchen has produce, provisions, and equipment. El Colmado is all about tapas like pan con tomate and croquetas made with smoked eel. 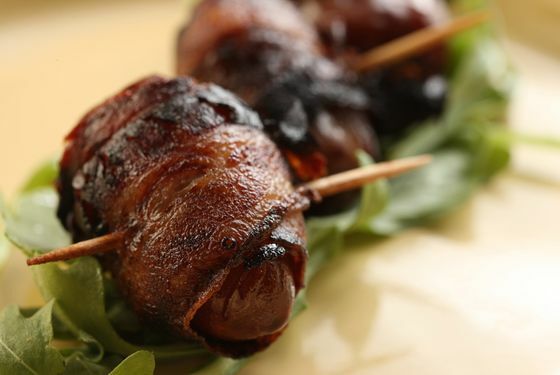 Here’s a close-up of the dátil con béicon, a date stuffed with almonds and Valdeón cheese, wrapped in bacon. 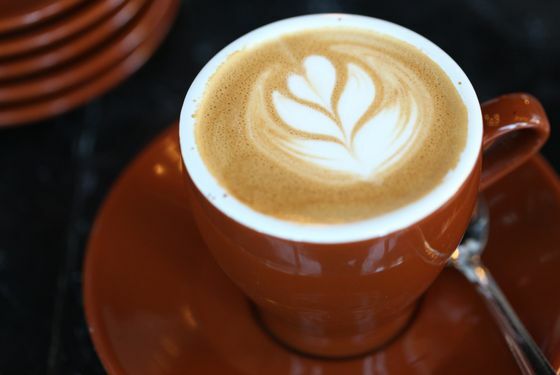 Finally, can you do some coffee? 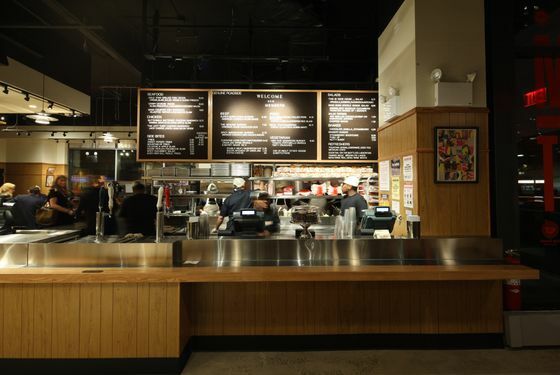 For those of you keeping score at home, here are all of Gotham West Market’s vendor menus. 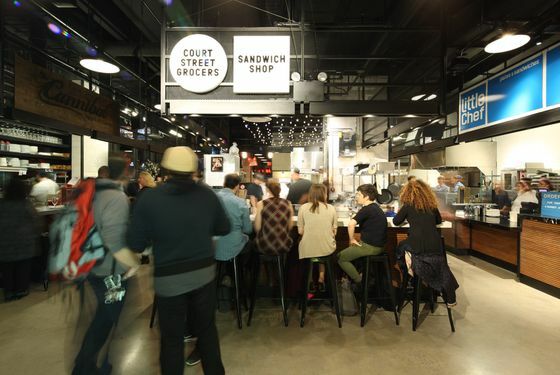 All the folks here are keeping different hours; visit Gotham West Market’s website for more information.